Looks like the database has been down for a little over 30 hours and the boinc daemons are still struggling. Not entirely sure what happened, but I'm working through trying to fix it. I apologize for the slow progress being made, all of the major MilkyWay@home scientists, including myself are visiting collaborators in Canada and have been quite busy. I will try to get things fixed over night. Everything seems to be working now. I'll check back in the morning to make sure everything is still working. I have successfuly reported all my finished tasks this morning and have received new CPU and GPU work. Edit: GPU tasks are apparently still scarce, getting only few of them. 9/24/2016 10:21:19 AM | Milkyway@Home | Sending scheduler request: Requested by user. Anyone else having a problem. 24/09/2016 17:02:33 | Milkyway@Home | Sending scheduler request: Requested by user. 24/09/2016 18:57:32 | Milkyway@Home | Sending scheduler request: To fetch work. Very similar. "No tasks available"
Yes, I don't get new tasks and send in work units stopt being validated after 13.30 utc. Message 65254 - Posted: 24 Sep 2016, 17:27:53 UTC - in response to Message 65253. 24/09/2016 18:23:24 | Milkyway@Home | Sending scheduler request: To fetch work. Message 65256 - Posted: 24 Sep 2016, 17:37:46 UTC - in response to Message 65254. I've been busy working on the GPU compatibility issue. I thought this issue was mostly solved a month or so ago, but it seems to be popping back up again. The issue is the work generator refuses to make work even when there is a clear need for it. I plan on looking into the issue more after I push the new version of MilkyWay@home out on Monday. I have an idea of how to fix this problem already so we will see how that works. Sorry it took so long to respond to your posts. In the future if you want a quicker response from me, try replying on a relevant news post. I don't read number crunching daily. Jake, looks like whatever you attempted to fix in the work generator is NOT working. Ready-to-send has plenty of work generated but nothing is going out when we request work. I got a full burst on one machine in the first two minutes that the project came back up, but nothing but dribbles since then on all three machines. Hope that you can fix the servers remotely from the conference. "Jake, looks like whatever you attempted to fix in the work generator is NOT working. Ready-to-send has plenty of work generated but nothing is going out when we request work. I got a full burst on one machine in the first two minutes that the project came back up, but nothing but dribbles since then on all three machines. Hope that you can fix the servers remotely from the conference." Same here. Server Status is showing a boat-load ready to send, but unable to fetch any of them. That's really strange. I'll give it a look when I get back to Troy tonight. Sorry it's taking so long to get responses. Message 65263 - Posted: 25 Sep 2016, 18:26:54 UTC - in response to Message 65262. Started getting CPU units late yesterday, but now the finished units wont upload and no new units of either kind are downloading. Here is a sample of my event log, from about the time this issue started..
9/25/2016 9:30:04 AM | Milkyway@Home | Sending scheduler request: To fetch work. 9/25/2016 9:33:03 AM | Milkyway@Home | Sending scheduler request: To fetch work. 9/25/2016 9:36:33 AM | Milkyway@Home | Sending scheduler request: To fetch work. I am getting plenty of both CPU and GPU workunits now. Haven't done anything, they just started flowing on their own. Uploading and reporting finished workunits also work fine. Message 65266 - Posted: 25 Sep 2016, 21:56:46 UTC - in response to Message 65265. Yes, I finally have the full complement of tasks on all three machines myself. Don't know whether Jake fixed things remotely or the servers unplugged the stoppage on their own, whatever ...... I am happy again. Some time gettings wus sometime not. If I try manual update boinc download new ones after a while I get no work and saw Milkyway@Home | No work available at log. There is a huge backlog of Nbody work units so that might be causing some issues with it wanting to hand out separation work units. I am hoping the clear out soonish and that will solve most problems. 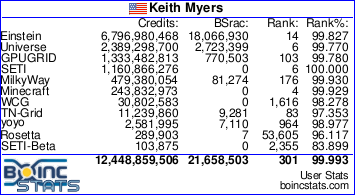 In the mean time, I will be recompiling all of the BOINC and MilkyWay@home daemons on the server today using the latest BOINC versions. This will hopefully fix most of our GPU recognition problems. I'll make a new news post when that is done so I can get feedback. Yes, there is a shortage of GPU workunits again. For the moment, I have plenty of N-body tasks for CPU, but nothing else.